Howdy. Any suggestions on seat covers which fit well for the more recent style front seats? The coverking seem great but they don't make 'em for those year seats, according to the gal on the phone. She said they only make em for the rear benches on 08-14 pass vans. 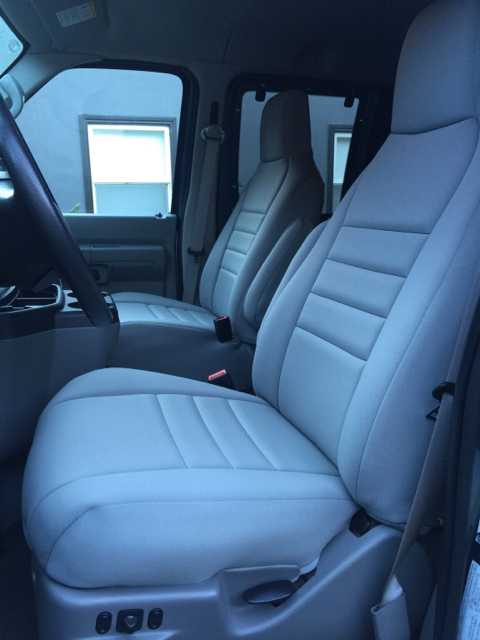 Re: Seat covers to fit 08-14 E-350 front seats? I have been wondering the same thing, but have not started shopping yet...I decided it's a MUST after I was was feeding my face and some pepperoni grease dripped off and...well, mad at myself ...Pics/info if you do find something! wet okole make the best any color for any seat. their in orange county. wet okole in orange county, the best! they do make a tactical seat cover that fits and they are great. Thanks gang. Carl the tactical ones were what I was hoping to get they seem great - would you mind posting a photo of yours? I guess either they stopped making them or I was misinformed. The SmittyBilt tactical seat covers are good. They aren't meant to cover every square inch of the seat itself, but add a ton of storage for all the nick-nacks I tend to keep in the van. Update I went with the wet okole thanks for the recommend berns378 I wasn't initially a fan of wetsuit material but now that I have them in they're pretty great and the stitching matches the contours of the seat nearly perfectly. Fits nice and snug. I got the single color gray to match the oem fabric which I liked but the ford fabric is crazy susceptible to stains - even clean water. Interestingly it was for sure worth going down to orange cty to have the guys install them bc one needed to be redone to accommodate for the fact the driver seat has a different design due to being power. Might have been hard to sort this out on the phone. Anyhow this they resewed easily in about half an hour and on my way. Good stuff. They look great. Tell us how they wear over time.